f the five come alongs I’d like to present, Come Along #3 is probably the most complex. Yet each step of the progression can be used individually, as an end method of control. Control. Without instant control, there can be no real come along. 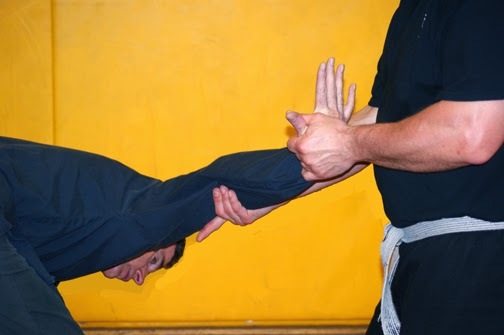 In fact, when we test in the Canadian Jiu Jitsu Council, Black Belt candidates must exhibit control over the uke from the beginning to the end of the technique…under any circumstances. 1. 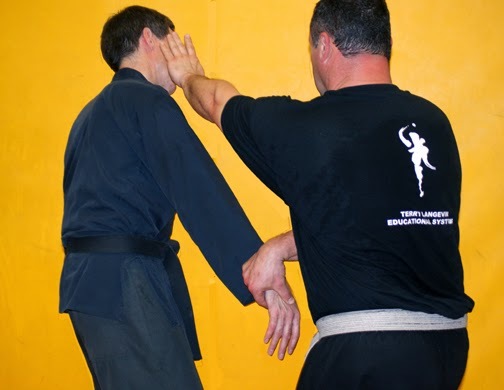 Sensei Terry Langevin moves toward Sensei Dan VanExan’s right side, grasping VanExan’s right hand while slapping, pushing or striking the right side of VanExan’s head in order to destabilize him and prevent a counterstrike from VanExan’s left side. 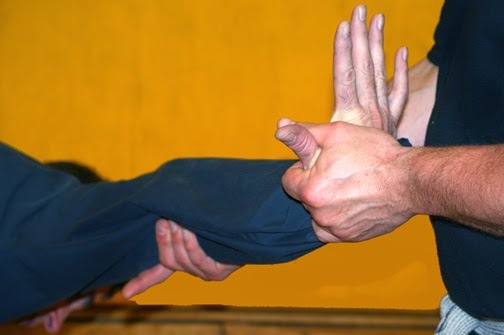 The object – immediate control of VanExan’s right hand. 2. Langevin rolls the arm over in a clockwise direction. The palm of VanExan’s right hand now faces him with the fingers pointing toward the ceiling. Langevin presses VanExan’s hand forward and down. At the same time, he pulls the wrist toward him. It’s a small – and very painful – circular movement. At this point, Langevin usually directs a right front kick into VanExan's ribs. 3. 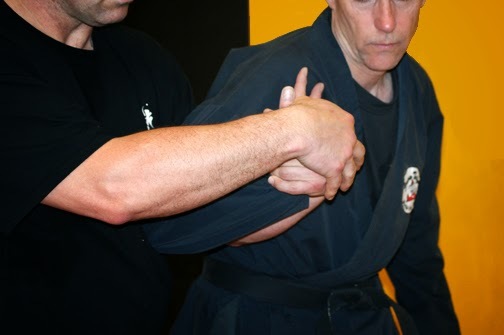 Still controlling VanExan’s arm with his left hand, Langevin grasps the inside of the elbow with his right hand. Notice how Langevin has shifted control of the right hand by grasping VanExan's thumb. Above, you can see a close up of the same movement. Notice how the grip on the hand has changed to encompass the base of the thumb. 4. Langevin swings VanExan’s arm around and up with his left hand. At the same time, he pulls the arm in toward him with his right hand. 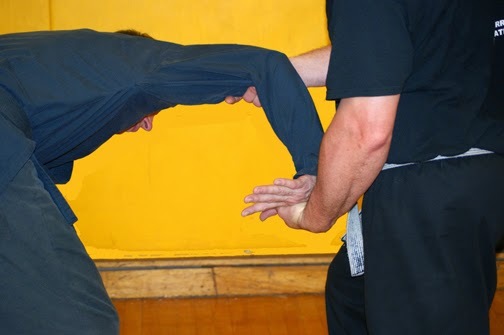 It’s a double action movement, adding a stronger form of control over this stage of the technique. Langevin steps toward VanExan while doing this. 5. The finished product – Langevin is now at VanExan’s right side . Both are facing in the same direction. VanExan’s elbow is pinned against Langevin’s mid-section while Langevin places an inward pressure against the back of VanExan’s hand. Pressure on VanExan’s wrist comes from two angles – from the direction of the elbow and of course from the back of the hand. Indeed, the grip – and level of control – is vice like. 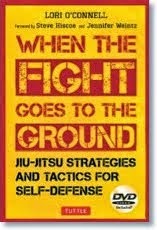 I’d like to thank Sensei Langevin and Sensei VanExan for demonstrating this come along. 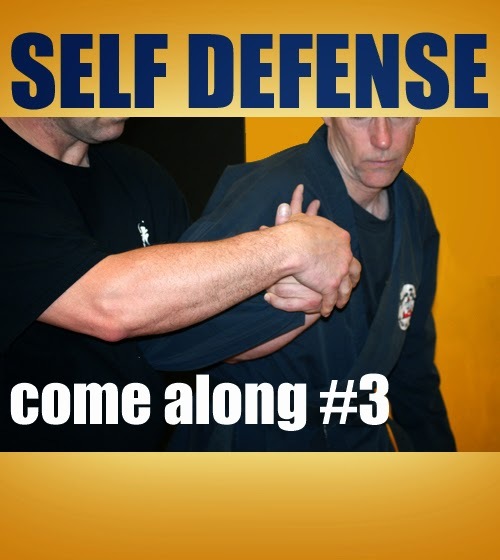 Both are professional instructors with many years of experience. 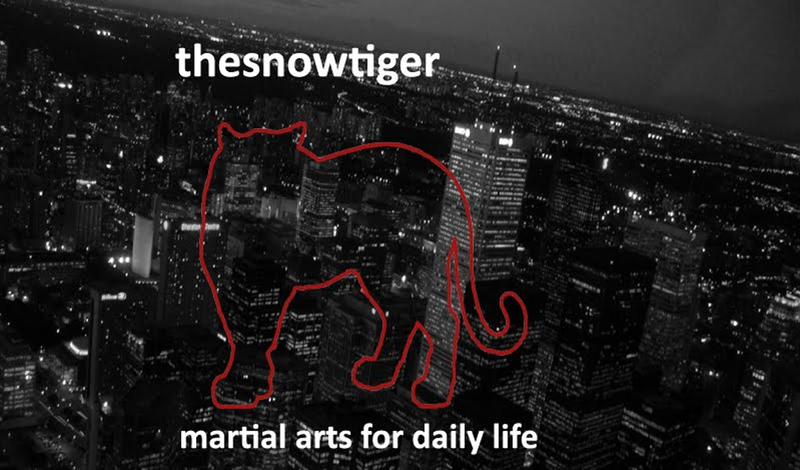 If readers are interested in learning from two highly qualified and truly caring instructors both at a class and a seminar level, please do not hesitate to contact them.